Founded in 1971, Theatre Project, a small, intimate venue in Baltimore’s historic Mt. 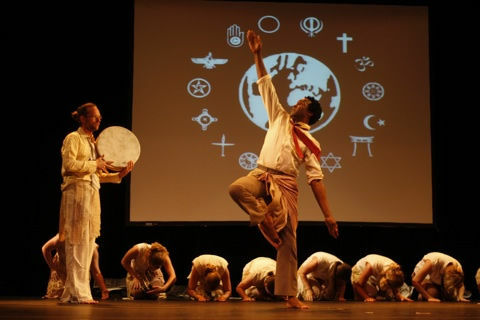 Vernon – through the presentation of a diverse array of original and experimental theatre, music and dance – connects the artists and audiences of Baltimore with a global community of performers. It seeks to nurture artists who are actively experimenting with new forms of expression and supports both performers of international reputation and emerging local companies creating new work. Help young teens dream and do during Theatre Project’s Second Annual Summer Lab. Over four weeks, a group of sixth to eighth graders will mount a wholly original production, to be performed at Theater Project. They will collaboratively build an original script, sets and costumes, and perform as an ensemble. The production will make use of techniques that the students learn during guest artist workshops, while being devised from their own interests and dreams for theatre. Interns will assist with workshops presented by guest artists, offer workshops in their own areas of expertise, facilitate the creation of the final piece, and chaperone local field trips. Experience with middle-schoolers a plus, but not required. This year promises great workshops by local guest artists in a variety of fields from vocal percussion to Linklater Technique, improv comedy to Applied Theatre, modern dance to Laban. The Lab is directed by Donna Sellinger (MFA, Theatre Arts; Towson) of The Missoula Oblongata. Interns are encouraged to lead workshops in areas that they feel comfortable in. If you have a specific skill that you are confident teaching (mask-making, dance, voice, improv, tumbling, dialects, writing, etc.) please let us know. Last year’s interns say that the internship is fun, at times hilarious, and exhausting, but also exhilarating. Over the four week period, you will get to know the campers and your fellow staff well. You will watch students be stretched and grow as performers and people. You’ll probably be stretched and grown yourself. Summer Lab will take place on Mondays through Fridays from June 27th to July 22nd from 9am to 4pm. The internship will begin the previous week, June 20th. The schedule is flexible, but interns should be available for as much of that time as possible. A modest stipend and/or credit will be available. Flexible schedules –10 to 20 hours per week– mostly during the day. Public/Press Relations: institute a comprehensive marketing plan that includes drafting press releases, mass communications to patrons, advertisement distribution and social networking. Important skills: written communication, multi-tasking. Flexible schedule –10 to 20 hours per week– weekday, evening and weekend hours starting in the Fall. Assist with show load in and any necessary building and production set-up. Help with light design and hang. Run lights and/or sound during shows.